- When I have just introduced myself to PoE, I quickly noticed that something feels strange. Weapon tooltips are vague. Attack speed bonuses are providing non-uniform gains. Also there have appeared many questions when it came to the build optimizations. If you are interested in attack speed mechanics behind the game facade, than here it is, the aggregated info on this topic. - This is still a WiP. Additional sections/explanations will be added over time. - One of staple notions in PoE is [action]. Action is character's activity, be it a swing, pistol fire or spell cast. - Every action consists of minimum two phases: [attack] which included the attack animation per se, and [recovery] which role-playing speaking is the duration for your character catching his breath and getting ready for the next attack. - A specific set of ranged weapons, namely: crossbow, arbalest, pistol, blunderbuss and arquebus have an additional phase called [reloading] during which the character reloads the weapon in question. * As you have noticed there is also a small delay between two actions. Tbh I haven't found any trace of it in the source code, but it's always there when you doing frapsing tests. It has a value of 5-7 frames which corresponds to 0.166-0.233 seconds. Most likely it is related to UnityEngine itself and the way it periodically checks for the events; with 1-2 frame variance coming from stuttering in case Unity was busy with something. P.S. 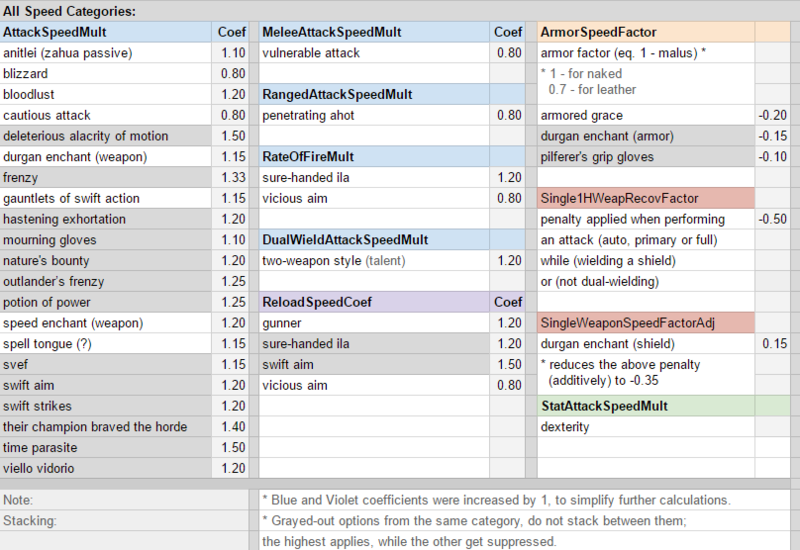 If you want to check these base values yourself, feel free to use a simple mod I've made for this purpose. Installation is quite simple, as it was made to work with IEMod Framework. - download IEMod. 5.1.0-beta Launcher for 2.03.0788 ZIP content preview will suit. - select "Launch with Mods"
Edited by MaxQuest, 12 May 2018 - 10:11 AM. - In order to increase your dps, you can do two things: increase your damage coefficient and reduce the time it takes an action to complete. - it might come as surprise, but not a single 'attack speed' buff, talent, enchant or modal does affect this phase. - is affected by armor penalties and all the buffs, items and enchants that do state that they do affect "attack speed". * How exactly these categories influence the final recovery duration check the tables below. - is affected by armor penalties and all the talents, buffs and modals that do state that they do affect "reload speed". Specifically there are only 4 of them: Gunner (talent), Sure-Handed Ila (chant), Swift Aim (modal) and Vicious Aim (modal). - Swift Aim suppresses Sure-Handed Ila's reloading speed bonus. ^ These are factored multiplicatively. E.g. a blunderbuss has 5s (or 150 frames) reloading duration. P.S. #forthehistory: Obsolete attack/recovery system can be found here. - attack with your main hand (while you have bashing shield in the offhand) still does suffer from Single1HWeapRecoveryFactor penalty. - 1h + bashing_shield does not benefit from Two-Weapon Style talent. But yes, it does benefit from Weapon and Shield Style. 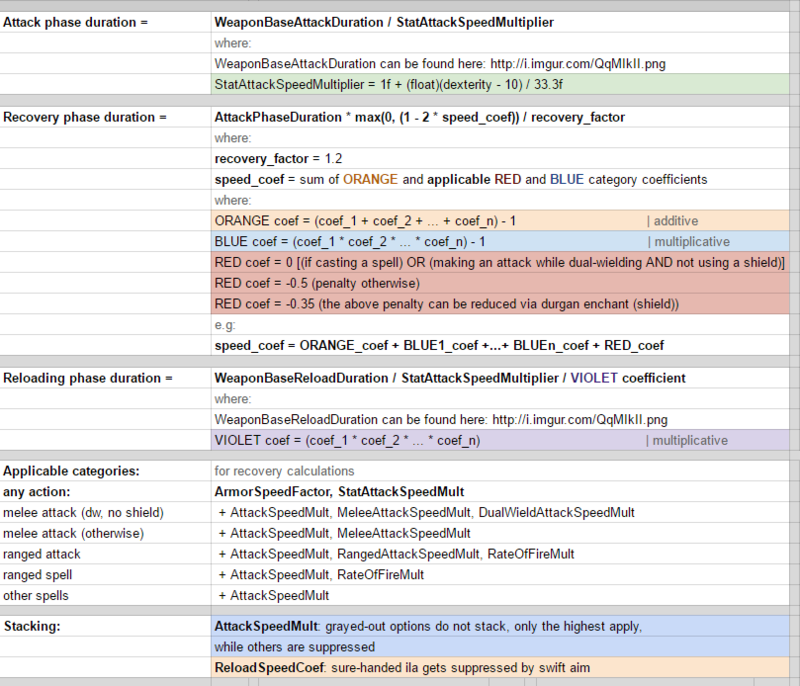 - if you have a [1h + nothing], [1h + shield] or [2h]: your action consists of: weapon_attack followed by weapon_recovery. - at zero recovery, is the best crit-based dps option, as you deal damage at the same rate as DW, while also having +12 acc and +15% hit-to-crit conversion from One-Handed Style. - is a better setup for full attacks, than [1H + Nothing] or [1H + Simple Shield]. It's especially great if it has any procs attached to it, like Barricade does. - cannot be echanted with weapon quality enchants or lashes. - at zero recovery, it is a clear dps loss (from auto-attack perspective) when compared with any other alternative. But it can be used by non-dps tanks, on whom you'd like to have some special effect, if present. - this setup can provide a dps-gain over [1H + Simple Shield], but mostly in the early game and vs very low crush-DR monsters; and yeah the biggest gain would be if you have no recovery reducing means except DAoM potion. Edited by MaxQuest, 04 April 2017 - 09:42 AM. Although each point of Dex does increase your attack, recovery and reload speeds by 3%, the relative gain is usually less. - the inter-action delay, which happens to be ~5 frames between any two actions. I don't know exactly how Unity works, but there seems to be some onUpdate schedule system which ticks periodically and checks for queued abilities, and that could be it's tick rate. If I am not mistaken it's possible to get into the same tick (i.e. get rid of the delay) but you would need to have 500+ dexterity. - the intristic diminishing returns. It's like: 3/2 > 4/3 > 5/4 > 6/5 and so on. Add a drop to a drop, and you get twice the amount; throw that drop into the sea, and nothing has changed. Edited by MaxQuest, 28 January 2017 - 08:12 AM. Sooo.... 2handers have the same recovery as 1handers? How come? No point in reserving the posts, there is only a limited edit period. Can we sticky this thread mods please? Yeap. Both logging and fraps testing have shown that two-handers have the same attack and recovery durations as average one-handers. Hmm, are you sure? I've tried to edit my very first post here (dated jan. 2016), and was able to. P.S. Updated the mod. And logged some stacking-related info here. Edited by MaxQuest, 08 May 2016 - 01:16 PM. It seems things have changed recently, we used to have only half an hour for edits. If I am reading this right armor adds a flat recovery speed that is not affected by attack speed multiplier? Also row 3 has 20 Dex listed when I believe it is supposed to read 10. Many thanks for digging through the source code and doing the experimentation. I'm too busy with work to do this stuff myself. I'll update the wiki with the information from here. Also, one of the things that really disappointed me in PoE was the fact that instead of adopting an equivalent of the personal initiative round system that the Infinity Engine games had, Obsidian designed a combat system around seconds and tenths of seconds, calculated in a nebulous manner so that not even the developers themselves can explain or document it. I really hope they change this for PoE2, or at least heavily tune it, so that combat is easier to read and information is communicated to the player in a clear way. Edited by Gairnulf, 09 May 2016 - 01:46 PM. This requires a longer explanation. Will be able to provide it tomorrow (not from the phone). 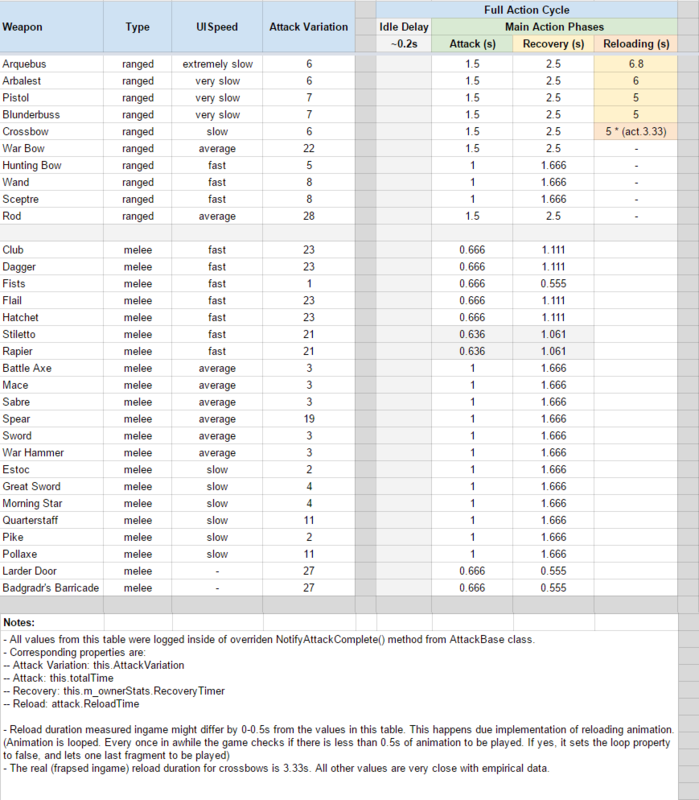 There are a plethora of different buffs, enchants, talents and abilities that do affect the final value of your recovery duration. // also ArmorSpeedFactor is a sum for armor recovery penalties. As you can see bonuses from different categories are applied additively. But bonuses that belong to the same multiplier category are applied multiplicatively. - spells and abilities, that do quality as AttackRanged, can also benefit from RateOfFireMultiplier. Also, one of the things that really disappointed me in PoE was the fact that [...] Obsidian designed a combat system around seconds and tenths of seconds, calculated in a nebulous manner so that not even the developers themselves can explain or document it. I really hope they change this for PoE2, or at least heavily tune it, so that combat is easier to read and information is communicated to the player in a clear way. 100% agree. Obsidian has overcomplicated things bringing the attack/recovery confusion to a whole new level. Mechanics should generally be straight-forward and transparent to the player. Edited by MaxQuest, 10 May 2016 - 06:16 AM. 30 minutes with the Backer Beta gave me the same opinion which I still hold now when I have over 160 hours with the full game. It's an interesting game largely in spite of its combat system. 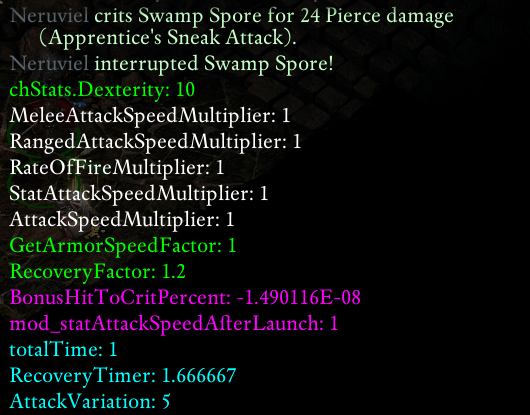 Attack speed has always been unclear since the beginning of CRPG. It has always involved some weird fractions, decimal number, etc... As the audience (even gamers) are reluctant to see it, game designers are likely to simply hide the numbers instead of showing frightening maths. For example, I have never found on the web a clear explaination about how Dual Wield and its perks worked in Skyrim. That's true that there is confusion in PoE, but only for optimal build seekers. I'm pretty sure casual gamers is totally happy with the unclear description from tooltip. That won't change that much game experience. For Casual player, "fast', "faster", "average" and "+20% faster" are clear enough. Edited by Elric Galad, 10 May 2016 - 08:46 AM. ^ Had a rough day, ehh? It's an interesting game largely in spite of its combat system. - If the weapon is marked as slow, player is logically to expect that it will be slower. - If action was broken into attack and recovery phases, it could be mentioned which phase exactly is affected by the buffs. For Casual player, "fast', "faster", "average" and "+20% faster" are clear enough. Edited by MaxQuest, 10 May 2016 - 08:57 AM. Also, "20% faster" can't ever be clear. "20%" of what? Edited by Gairnulf, 10 May 2016 - 10:02 AM.